I am lost in a forest of the night in a lucid nation. I awake, feeling uprooted. I find myself in a country deluded by surfaces. Dawn offers its mechanical chorus. If I peel off the bark of the night it reveals a stark, blank-eyed whiteness. Nothing is apparent of the frenzy within. There was a crucial dream. It came when my life was at a junction, at University. I had nurtured a childhood fantasy: to be a writer; more specifically, of comics. 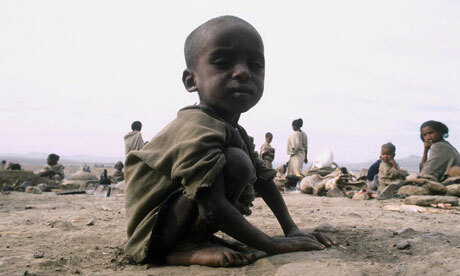 Yet, since then, the world's sicknesses had been displayed to me. Dismayed, I thought I ought to lend my life to healing them. Torn by the thorns of this dilemma I took myself away, to Paris. I sought answers in its galleries. In one, I witnessed, as if in another universe, a film of Max Ernst's surrealist collage novel, Une Semaine de Bonté. I am not sure whether this is the version I saw, but the Schoenberg soundtrack is entirely appropriate (thanks, Helen). Originally published as a book, it can be argued that this is an early example of a graphic novel, and has influenced later comics writers, for example Grant Morrison, in particular his Doom Patrol, as best exemplified by the story The Painting That Ate Paris. Nothing could have seemed more shocking and disturbing. I was an intruder in another reality, feeling as one transported to ours from a foreign culture might feel. I fell under its spell. Its alien logic, after a while, became as normal. That night, under canvas on the hard ground of the Bois de Boulogne, I returned to my origin nation. ...wrapped in torn pages from Strange Tales 118. 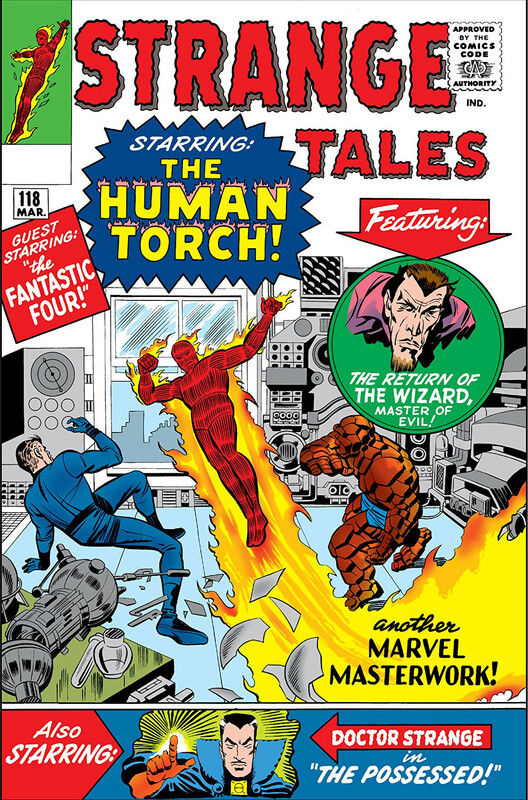 Stan Lee wrote both stories; Jack Kirby's dramatic pencils illustrated the first, where the Human Torch fought the Wizard with his anti-gravity discs. Steve Ditko's surreal line work on Dr Strange showed how, beneath surface reality, something sinister lurks. This was the first Marvel comic I ever read, as potent as a first cigarette. I woke, convinced that the message conveyed was that: if I were to write comics, then, should one child's life be changed for the better from reading one of my stories, it would be worth my while. Eight years later I found myself writing for Marvel comics. 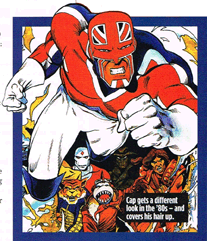 Taken from a recent issue of SFX magazine, containing an article on Captain Britain, including my stint on the title. 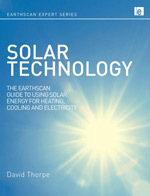 Nowadays I find myself writing prosaic tips for combating climate change. Yet nightly, I still bathe in the radiation from hidden worlds. I plan to lose myself in those forests soon. What a brilliant post!!! David I think there are no comments because everyone is too frightened to comment. The clip is mesmerising. I've never come across the work before. And the music is absolutely brilliantly chosen for the film. It had my heart palpitating... there's even a moment when the water comes flooding in and the music resonates and surges with it. It couldn't have been better chosen. I kept thinking of Paula Rego's etching,The Flood from her The Pendle Witches series... the same sense of helplessness and peril. What is so fascinating is that the images were all cut from illustrated magazines so you get the furnishings and fashions of the time... cabriole table legs, nipped waists... all very ordinary things but when put together with dragon wings and birds' heads and sphinx's staring in through train windows, giving such bizarre results and a terrifying sense of vulnerability and threat. I can empathize with you sleeping on the hard ground under canvas in the Bois. I did the same sometime in the 70's but without the epiphany! A great blog... I'll have to watch the clip again but now I see your connection to the comic artist who commented in the BBC4 Lichtenstein film.